Luvable Friends 24 Piece Gift Cube is a great set of baby clothes for any newborn. Each set includes 5 Bodysuits, 2 Sleep & Plays, 1 Tee Top, 2 Pairs of Pants, 3 Caps, 3 Pairs of Scracth Mittens, 2 Blankets, 6 Bibs & a reuseable vinyl bag. All pieces of the set are designed to look great together to make dressing your little one nicely as easy as possible. 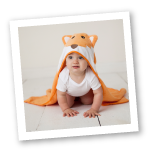 Made of super soft cotton the set is designed to fit babies up to 6 months old. The perfect baby gift all in one!